Three illustrated player handouts—including a deck of 12 cards that is used to determine the fate of the characters! In northerly moors, evil witches are to be found. That might be enough to get the party heading that way... It is suggested that a well-balanced party is best for this adventure, but that there are some aspects best suited to a sorceror. If you don't have one, don't worry, they can be re-tuned to work with a wizard instead. 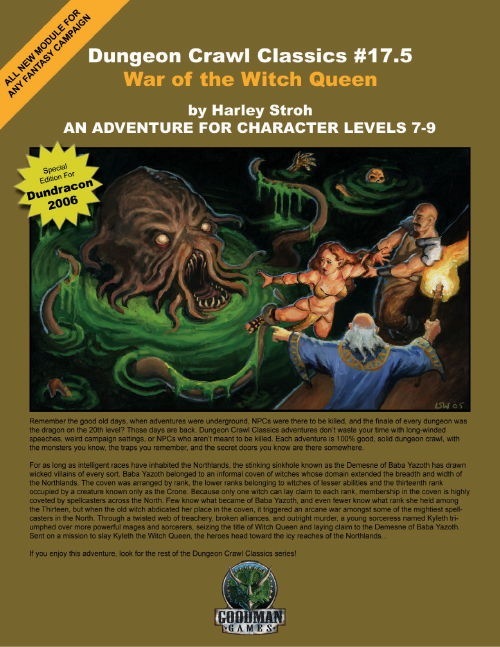 The DM's materials include scaling information, a wandering monster table, an adventure overview and the detailed backstory. Apparently there was an entire coven of witches living in the area, all evil, and they fell to squabbling. As a result of this, with plenty of treachery and broken promises as well as outright brawling, a young sorceress claimed the title of Witch Queen. Her hold over the title and the rest of the coven is still tenuous, and this looks like a good opportunity to rid the area of these evil witches entirely! The adventure starts on the brink of a sinkhole in the moors, where the lair of the Witch Queen is believed to be located. It's wreathed in fetid mists and certainly sounds the part. How you get the party there, however, is left up to you. The first part of the adventure involves fighting and bypassing traps to actually get to the entrance of the lair itself. The second part of the adventure begins when the party pass through a magic portal into the dungeons of the Witch Queen. That's when the fun starts. Traps and monsters abound, and it soon becomes clear that all manner of horrible things go on in these depths... and only after these have been navigated will the party be able to enter the final part, an extradimensional space where the Witch Queen herself is to be found. Needless to say she's none too happy about this and attempts to flee before she is killed, as she assumes anyone surviving thus far will be powerfull enough to send her for a dirt nap. There's little in the way of follow-up adventure ideas, unless of course one of the party fancies becoming the next Witch Queen! This does present some intriguing possibilities... Resources include five pre-generated characters (which need transferring onto character sheets, they are a jumble as presented) and lots of 'this is what you see' pictures to display. Ok im stupid. Ive been looking for this so long that I got excited today when I found out it was available again in PDF at another place. I should have waited 30 seconds longer and searched for it here. Still looking for a print copy of this if anyone wants to part with it.